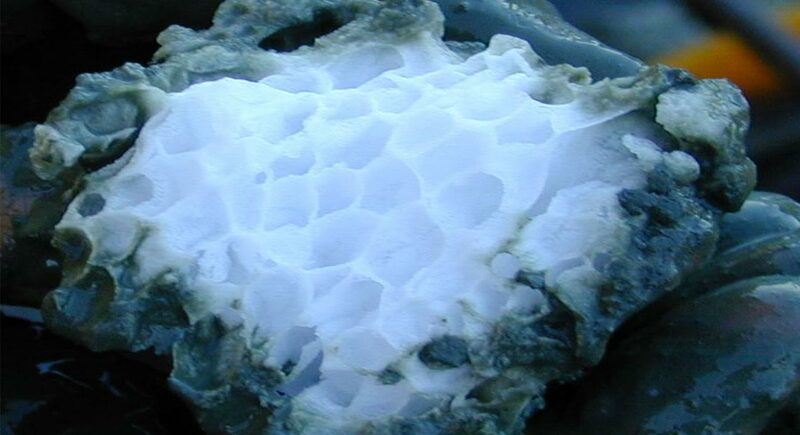 Gas hydrates, or methane hydrates, are created when methane is frozen in the molecular structure of ice. They are classified as clathrates, compounds formed by the inclusion of one molecule within cavities in the crystal lattice of another. A unique property of clathrates is the absence of chemical bonding, which makes it possible to separate them relatively easily. When methane hydrates are warmed or depressurized, it will revert back to water and natural gas. Hydrate deposits generally occur in two types of settings: on submarine continental slopes and in deep ocean floor sediment where temperature and pressure conditions are suitable for their formation. The majority of the gas hydrates supply is found over 1,600 feet below the sea’s surface. Methane that forms hydrate can be both biogenic (created by biological activity in sediments) and thermogenic (created by geological processes deeper within the earth) Office of Fossil Fuels, US Department of Energy. “Methane Hydrates” http://energy.gov/fe/science-innovation/oil-gas-research/methane-hydrate. Accessed May 2015. Office of Fossil Fuels, US Department of Energy. “Methane Hydrates” http://energy.gov/fe/science-innovation/oil-gas-research/methane-hydrate. Accessed May 2015. Office of Fossil Fuels, US Department of Energy. “Methane Hydrates” http://energy.gov/fe/science-innovation/oil-gas-research/methane-hydrate. Accessed May 2015. Office of Fossil Fuels, US Department of Energy. “Methane Hydrates” http://energy.gov/fe/science-innovation/oil-gas-research/methane-hydrate. Accessed May 2015. Office of Fossil Fuels, US Department of Energy. “Methane Hydrates” http://energy.gov/fe/science-innovation/oil-gas-research/methane-hydrate. Accessed May 2015. . Heating the hydrates using hot water, steam, electromagnetic radiation (such as microwaves) or electricity. These methods would raise the temperature so that the hydrates would melt, releasing the natural gas. Lowering the pressure of the hydrates. Lowering the pressure would also cause the hydrates to melt, releasing the natural gas. Gas hydrates present a vast untapped resource of natural gas, with estimates placing hydrate reserves as greater than the known reserves of all oil, natural gas, and coal in the world. Despite this promise, future production volumes are speculative because methane production from hydrate has not been documented beyond small-scale field experiments. Large-scale commercial operations to develop gas-hydrate deposits are at least a decade away. There are many challenges in exploiting gas hydrates. Drilling operations intended to extract methane from hydrates have to cope with the volatile nature of the gas and its expansion as it rises to the surface from a high-pressure to low-pressure environment. In addition, all deposits are located in the Arctic, which is one of the world’s most fragile biological environments. Therefore natural resource production in this area is met with concern and criticism. Methane is a potent greenhouse gas and the impact to climate change as a result of hydrate exploitation is a significant concern. ^ Office of Fossil Fuels, US Department of Energy. “Methane Hydrates” http://energy.gov/fe/science-innovation/oil-gas-research/methane-hydrate. Accessed May 2015. ^ American Petroleum Institute. “Natural Gas Hydrates May Help Fuel the Future”. http://www.api.org/environment-health-and-safety/environmental-performance/innovation/natural-gas-hydrates-may-help-fuel-the-future. Accessed May 2015. Sorry, we do not yet have a video specifically for Gas Hydrates. We are adding new videos to StudentEnergy.org weekly, but in the meantime check out this video on Natural Gas.